There has been a lot of talk lately about the bullish internals of COMEX silver, and rightfully so! The size of the Speculator net short position is the largest in two decades, and this is a decidedly bullish indicator. Since all of this data comes from the weekly, CFTC-generated Commitment of Traders reports, we thought it would be fun to take a look back today and compare/contrast the current open interest and CoT structure to 2011, the last time price got "disorderly" to the upside. 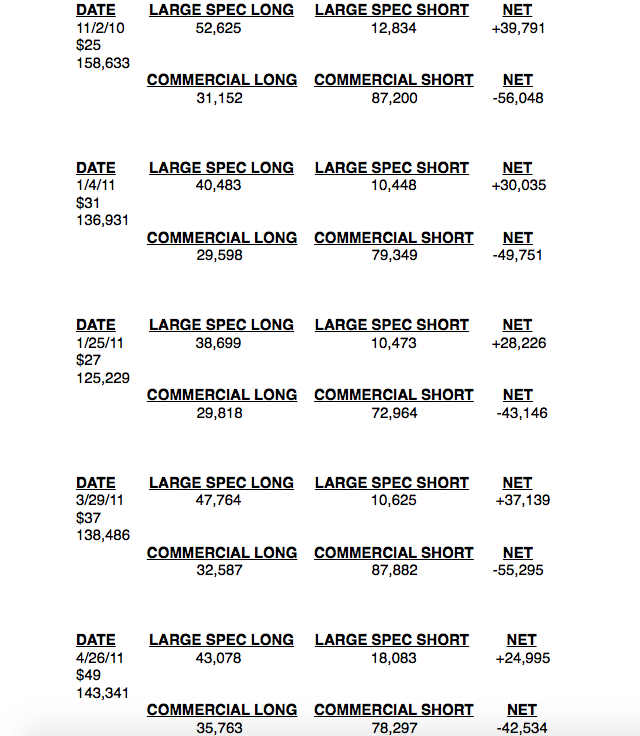 As has been noted across the precious metals boards, the most recent CoT report, surveyed on Tuesday March 20, showed an all-time record high Large Speculator NET short position and an all-time record low Commercial NET short position with the Small Specs as the only category still showing a small NET long position. For what it's worth, the only other time the Large Specs in silver had a NET short position even close to this level was in late July of 1997. As you can see below, price rallied nearly 67% in the six months that followed. Given all of this current emphasis on the CoT report, we thought it might be fun to look back today to the rally of 2011 and remind everyone again of the CoT and open interest structure during that period. 1. Note the total open interest. Why would the supply of digital silver be 50% greater in 2018 versus 2011? And don't give me that nonsense about producer hedging. Where's the data showing this to be the case? Instead, after falling below 100,000 contracts in the days following the MFGlobal debacle in late 2011, total COMEX silver open interest soared to an all-time high of 234,787 contracts (representing 1,173,935,000 digital ounces!) on April 20, 2017. As of Monday, total COMEX silver open interest is once again near all-time high levels at 217,662. 2. Note the relative consistency of the Large Spec and Commercial positions from November 2010 through March 2011, even while price rallied nearly 50% with the onset of QE2 and a sinking US dollar. 3. Note that the Large Specs were always NET long and the Commercials were always NET short and compare this to today. But finally and most importantly, consider this. Even seven years later, the notion persists that silver was in some sort of speculative bubble in 2011 ... as if every shoeshine boy and taxi driver was long silver futures in an epic price blow off. As you can see above, however, the actual data betrays that fantasy. Instead, the final 25% rally in April came solely upon the back of a massive short squeeze of the "Commercials" in silver ... the Bullion Banks. As price moved from $38 to $49 in four weeks, the Speculators were selling. What drove the price was Bank short-covering, and the data proves this out! As the crisis grew, the CME intervened with five margin hikes in nine days. Price was smashed, beginning with the Sunday Night Massacre of May 1, 2011. JPMorgan, which very likely stood as the naked short getting squeezed in April, was quickly approved to open their own COMEX silver vault (https://seekingalpha.com/article/259549-will-jpmorgan-now-make-and-take-delivery-of-its-own-silver-shorts), and they have used the seven years since to amass a hoard of nearly 140,000,000 ounces in order to prevent a repeat of such an extinction-level event in the future. So, we go forward from here, rightfully expecting a rally in COMEX silver sometime soon as the Large Speculators (hedge funds, managed money accounts, technical trading funds) get squeezed. But we are under no illusions as to which forces are truly in charge in this sham of a "market." After nearly losing control in 2011, The Banks have learned their lesson, and they'll be certain to manage price more carefully the next time silver breaks out to the upside.